In 1871, Darwin predicted that humans evolved in Africa. European scientists thought his claim astonishing and it took the better part of a century for Darwin to be proven correct. From Raymond Dart’s description of the Taung Child Skull in 1925 to Lee Berger’s announcement of Homo Naledi in 2015, South Africa has been the site of fossil discoveries that have led us to explore our understanding of human evolution. 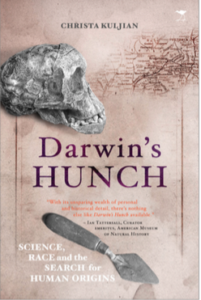 Darwin’s Hunch reviews how the search for human origins has been shaped by a changing social and political context. The book engages with the concept of race, from the race typology of the 1920s and 30s to the post World War II concern with race, to the impact of apartheid and its demise. The book explores the scientific racism that often placed people in a hierarchy of race and treated them as objects to be measured. In 1987, the publication of “Mitochondrial DNA and Human Evolution” suggested that all living humans could trace their ancestry back to an African woman 200,000 years ago. Again, many scientists and the general public in the West were slow to accept such a claim.